Ancient, enigmatic Georgia, enviably positioned between the Caucasus Mountains and the Black Sea, lays claim to one of history’s greatest civilizing feats: the first domestication of wild grapes more than five thousand years ago. This means that Georgian grape growers developed the genetic ancestors of all the noble winemaking vinifera (Chardonnay, Cabernet Sauvignon, Pinot Noir, etc.) now grown the world over. Forevermore, every Champagne toast should begin and end with Georgia on your mind. 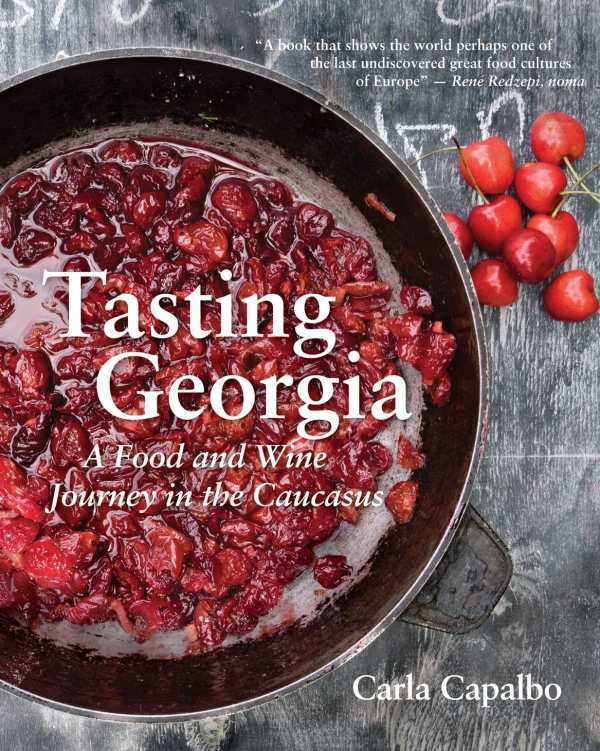 The latest of Carla Capalbo’s dozen-plus regional books that expansively cover the culture of food and wine production—chefs, farmers, winemakers, grape growers, recipes, in-depth historical detail, and high-quality photography—Tasting Georgia divvies up the country into ten regions (ten chapters), from capital city Tbilisi in the southeast to Guria and Adjara on the northern Black Sea coast. And while the style of cooking and local dishes are distinct as you move about, and interesting details about the country’s lengthy, complicated history keep the pages turning, it’s the photos and descriptions of individual winemaking operations still utilizing thousand-year-old methods that capture the imagination. An agricultural country of stunning beauty far removed from the bustle of tourism-weary western Europe, Capalbo has done the great service of bringing the country’s treasures within reach of any visitor through the use of maps, listings of hundreds of places of interest, and suggested itineraries.